H 8 H, I hear you say, what’s that? Actually a rear-engined half-track with the suspension of the SdKfz 251; but only a few were built, so it’s not surprising that it is hardly known. Slightly less obscure are the Saurer wheel-and-track vehicles, and one of these designs was intended as a reconnaissance vehicle though, again, few were built – hot-climate tests showed that temperatures could reach 180 F (82 C) at the driver’s feet so it’s not surprising that this one didn’t go into service. Both these types are described and shown in photographs. Next is the SdKfz 250/9, described in text and shown in photographs of both “Alte” and “Neue” body types. Modellers will find this section very helpful; it even includes photos of the interior arrangements and external stowage, with captions, from the vehicle handbook. There’s no excuse for getting your model wrong now! After this comes the celebrated Luchs, or Pz II ausf L if you insist. Text with all the known unit allocations, photographs (including one showing just how clogged with mud the suspension could get) and true 1/35 scale plans. I was there when they did some of the measuring for these plans, and can vouch for the trouble taken to get all dimensions exactly right. Then there’s a Luchs variant with sloped armour, a real challenge for modellers as a conversion from one of the older available kits now that the new Bego one has lifted the bar for builders of the normal type. The real thing was a one-off conversion from Luchs V29, and was fitted with a Tatra air-cooled engine and a modified turret. No plans for that one, alas, but keen modellers will be able to work out enough to do the job from the four photos included here. Next is the Skoda T 15, an unsuccessful design rejected by the army after testing. Among other “delights” the driver had to sit crooked to get into it at all. Only a little more successful was the Pz 38t neue Art, with a kit available if you want to model it. 5 were built, but testing ended in January 1943 without its adoption for service. Following that we have the Panzerspaehwagen 38t a.A, SdKfz 140/1, and again with a kit available. The description includes known unit allocations, with only 5 vehicles unaccounted for of the 70 built. To end the book there are photographs of the full-scale models of two versions of it modified to mount the 7.5 cm Kanone L/24, and of the Bergepanzerwagen 38 converted to mount the same gun. 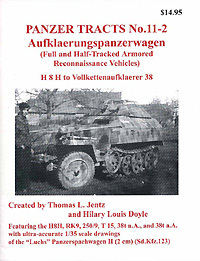 This is another essential addition to any reference collection on German WW2 tanks. Only one set of plans, but what a feast of information! Very highly recommended.